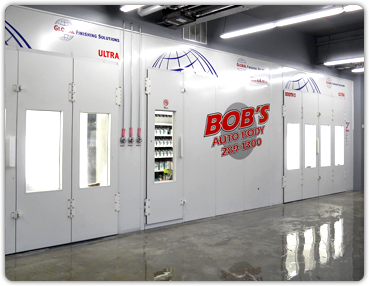 At Bob's Auto Body, service is our focus. That means service for you and service for your vehicle. With that in mind, by the time you pick up your car, truck, or sport utility vehicle, it's our goal to not only ensure that your vehicle looks flawless, but also that you're happy with the service you received. Frequently we're asked: "Do you do this?" No matter what it is, from a tiny scratch to a crushed bumper, the simple answer is "YES". Bob's Auto Body is a Massachusetts State Registered Auto Body Repair Shop #3053 and is fully bonded, licensed, and insured. No matter the extent of your vehicle's damage, we can help. From a door ding or minor fender bender, to a full blown collision - we have every tool at our disposal to erase the damage and give you a car that's better than it was when you dropped it off. Through the combination of modern equipment, a full mechanical shop for alignment and suspension work, and a paint shop that ensures a perfect, even finish - you can be sure that you're getting the best mechanical repairs, body work, and expertly matched painting available to you. Contact Bob's Auto Body Today! For more information on collision repair, suspension and alignment work, or auto body repair repair, mechanical work, or painting, please don't hesitate to give us a call at (781) 289-1300.